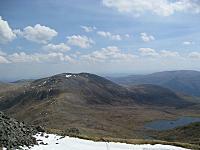 Sgurr na Ruaidhe is the most easterly of the three Munros enclosing Coire Mhuillidh. 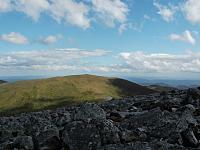 It has a rounded summit at the intersection of five ridges two of which are normally used for ascent. These are the NW ridge which links to Carn nan Gobhar, and the SW ridge which leads to the path, to Glen Strathfarrar, in Coire Mhuillidh. The slopes to the N and W are generally less steep than those to the S and E and these are the slopes used for access. 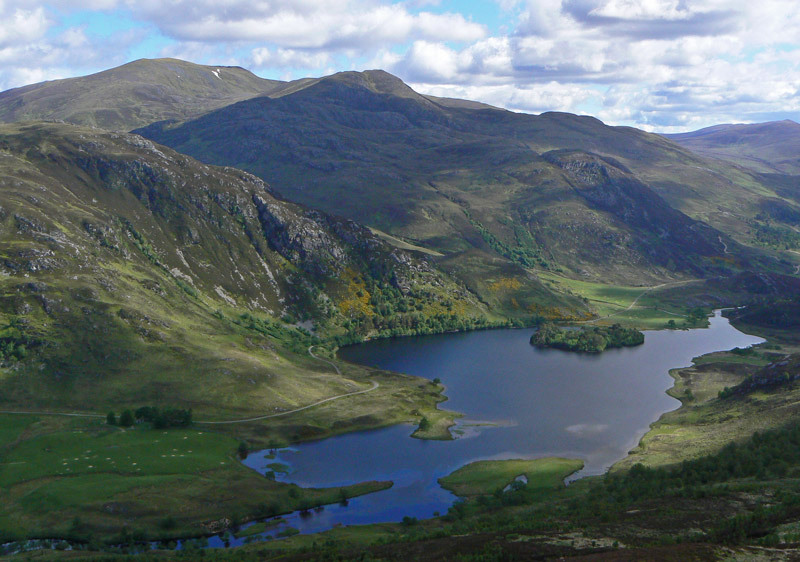 Sgurr na Ruaidhe and Loch a' Mhuillidh from Sgorr na Diollaid; 14 June 2013. Looking back to the summit of Sgurr na Ruaidhe from the slopes of Carn nan Gobhar. Sgurr na Rhuaidhe, our last of the day we travelled west to east, from Carn nan Gobhar on 2/7/10. 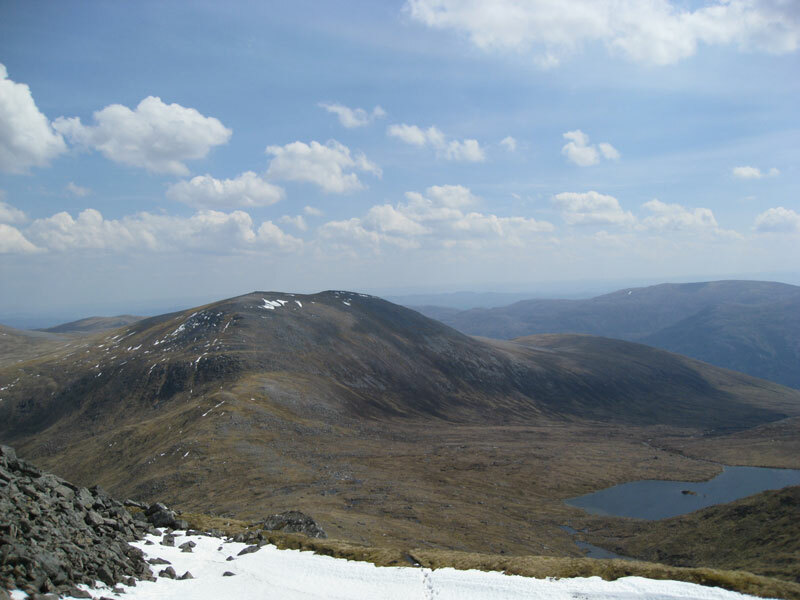 The summary information of one or more ascent routes that include Sgurr na Ruaidhe. 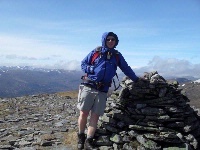 1 2010 m 52.32 km 14 hrs Sgurr a' Choire Ghlais, Sgurr Fuar-Thuill, Sgurr na Ruaidhe and Carn nan Gobhar [Glen Strathfarrar] Strenuous route but with good access path and rocky ridges. 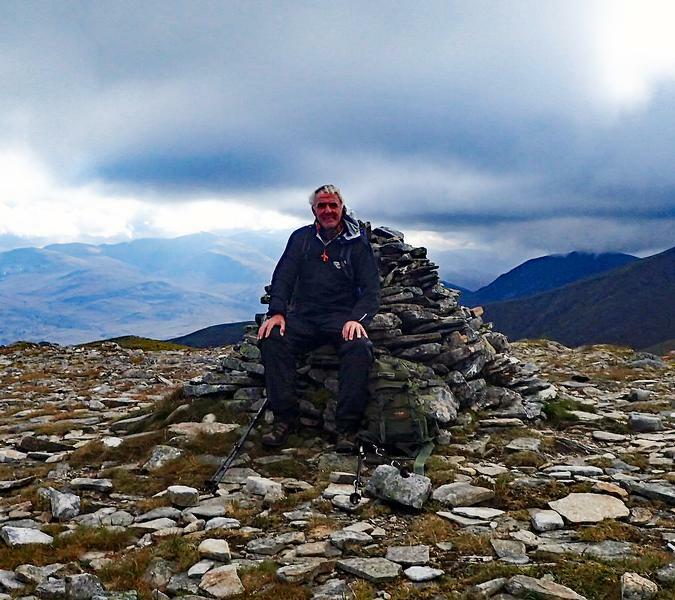 If the route is too long, then climb Sgurr Fhuar-Thuill alone as the other 3 can all be climbed from the path into Coire Mhuillidh..
Roy is taking the photo of John. Wind blowing over camera when trying selfie! 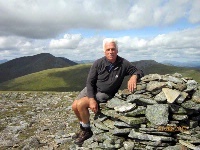 Enjoying the lovely breeze on the summit of Sgurr na Ruaidhe on a very hot day. Sgurr Fhuar-thuill in the distance. 19/08/2012. 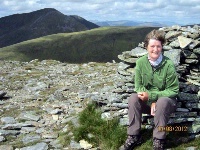 Me on top of Sgurr na Ruaidhe our 1st of the day, (17/4/11). Post a few words about Sgurr na Ruaidhe or read what others have had to say. Having a car at each end of the glen turns the Strathfarrar ridge into a reletively easy undertaking (7hrs for a reasonably fit group). The phone number for Struy access has changed. It is now 01463 761260. There is a locked gate a good eight miles down the glen from the starting point, don't try to climb these hills on a Tuesday as the gate is locked all day! 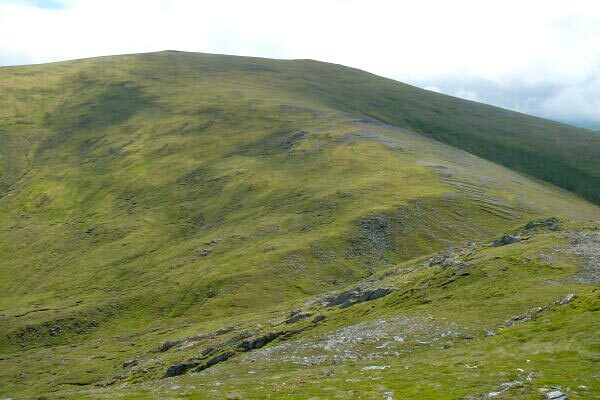 All other days a permit can be obtained from the house beside the gate, access is from 9 am to 6 pm so if you want to do all four munros a healthy pace is required!